I enjoy finding vegan recipes that appeal to my meat eating friends. 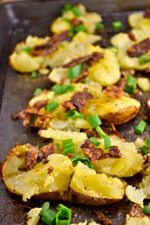 Here is a great alternate to say.. a potato skin appetizer. Or it can be a side dish. It’s made with Smoky Maple Tempeh Bacon which you must try! In case you are not familiar, tempeh has a rich, nutty and meaty texture. It will provide many nutrients and protein in a more digestible form due to the fermentation process. You can use it to make veggie burgers, add to a stir fry, salads and wraps. See my easy recipe for a TLT. Tempeh Lettuce Tomato open face Sandwich . Another quick and easy favorite. Send your thoughts!